Berl was in his late 60’s and looked like a slightly more conservative Dog the Bounty Hunter. He wore all black with alligator-skin boots that came to a sharp point. His face was tanned and cracked like a sun-baked leather mitt. 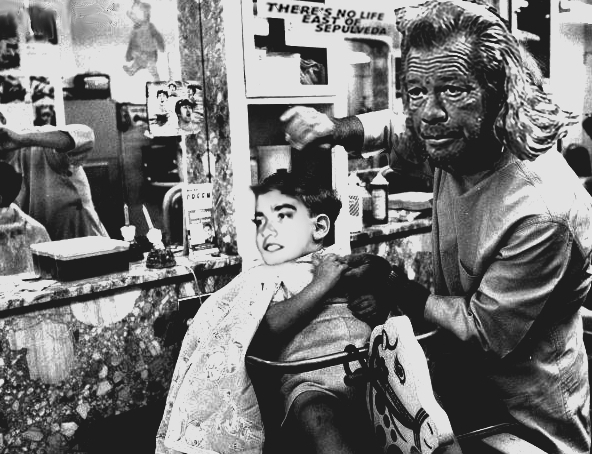 As he cut my hair, he talked about his former career as a music technician. He had toured with rock legends such as Pink Floyd, The Rolling Stones, and Led Zeppelin throughout the 1970’s. These same legends would also frequent Southern California for it’s nightlife, and Berl was a witness to much of their decadent behavior. Though, he dawned black, Berl exuded an uncanny level of local color. He was as organic and natural to Hermosa as the sand that lined its beaches. He was also giving me a pretty decent haircut. “There’s no life east of Sepulveda. It’s true! You see, in elementary school my buddies and I used to cut class and run down to the beach to surf. Our school was on the other side of Sepulveda Blvd., so when the teachers would come down to the beach to try to bring us back, we’d scream, ‘There’s no life east of Sepulveda!’ and run back into the ocean.” Berl’s battle cry soon became the motto of delinquents all across Hermosa Beach – a point that seemed to bring him sublime satisfaction. I parted ways with Berl, having received a great haircut and even better entertainment. I hope that more residents of Hermosa Beach can hear one of Berl’s barbershop sermons. Those who listen will be granted a unique insight into the majestic history that will forever exist in the town’s rear-view-mirror. Tales of bygone times are best amplified through the voices of people who have shaped an area’s history. Through people who too often blend into the landscape. Through people like Berl. I would like to contact Berl, as I knew his brother Dennis (Red) Pierce in 1974.